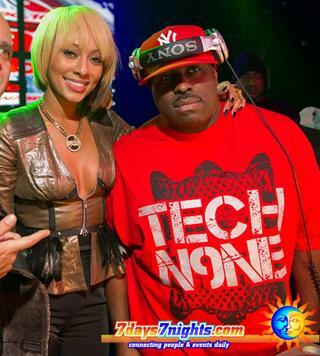 In a recent photo, Funk Master Flex is wearing a Tech N9ne t-shirt while posing for a picture with Keri Hilson at an event. Flex has been known for showing his support for Tech and Strange Music over the years and this photo proves he is also a satisfied customer at strangemusicinc.net (the official store for Tech N9ne merchandise). If you remember, Funkmaster Flex was the first to break the news about a possible Lil Wayne collaboration with Tech N9ne several months ago. There have been several reports that Flex is also a fan of Tech’s latest release, Bad Season, especially “Ego Trippin”, and he plays that regularly on his radio show. As you can see from the photo, Funk Master Flex has good taste and you can, too. Order your Red Crown Up, Crown Down T-shirt at strangemusicinc.net while supplies last!